Sartrex has proven design and manufacturing capabilities for the creation of complex control systems and instrumentation. Experienced management and engineers work with clients to ensure the process of turning specifications into technical drawings meet all of their requirements. With over 30 years working in the nuclear industry, Sartrex understands the need for technical designs to be manufactured in a consistent and reliable manner. Contact our team to discuss your technical specifications, design, and manufacturing requirements for projects in any industry. Sartrex Power Control Systems specializes in integrating Programmable Logic Controllers (PLCs) into complex systems for Process Automation and Instrumentation. The company has an expert team of software engineers, electronic engineers and mechanical engineers who can design systems requiring the utmost in complexity and reliability. These engineers are capable of designing systems from the ground up, providing turnkey products for your needs. 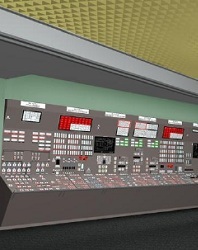 Many of the systems provided include industrial control computers and network switches. 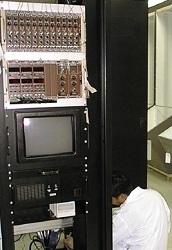 Most systems are housed in seismically qualified cabinets will survive the most rigorous operation environments. 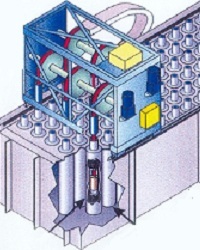 The CANDU Safety Shutdown System consists of two separate systems designed to shutdown a CANDU reactor during an emergency. Its reliability is critical for the safety of the public. 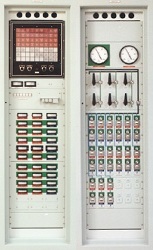 The system consists of highly reliable instrumentation cabinets incorporating: Various Indicating Meters, Current Alarm Units, on Chamber Amplifiers, Signal isolators, Conductivity Transmitters, In-Core Flux Detectors. The Sartrex Advanced Digital Control Centre represents a giant leap forward in the control of power generation facilities. 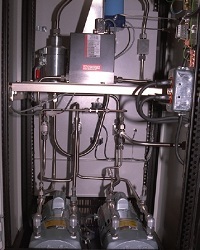 Sartrex, in partnership with AECL, designed this complex system and currently manufactures and markets it worldwide.The stringent requirements imposed by such standards as ISO9001:2008 and CSAZ299.2 enable this system to operate in all types of power plants, including heavy water nuclear, light water nuclear, coal, gas and others. Its flexible software display engine allows for easy customization to different plant configurations. Its modular design also enables customers to select elements of the system for new installations or selective plant upgrades. For example, they may choose to upgrade the large screen display, and software, and use existing operating desks, or any other similar scenario. The Sartrex Failed Fuel Location System (FFLS) identifies a failed fuel channel in a nuclear reactor. It senses neutron decay in the heat transport water (heavy water) leaving the reactor core. During the nominal fission process, the fuel rods retain nuclear fuel, If radioactivity escapes from the rods into the surrounding water, the FFLS will detect the high levels of delayed neutron activity.The process commences by piping the heat transport water from the core to a moderator tank where neutron detectors, suspended in a coil of the piping, can determine the intensity of neutron radiation. These monitor heavy water samples from each reactor channel, individually, to detect a comparatively high level of delayed neutron activity. After circulation through each of the tubes, a header system returns the water to the pump return line. 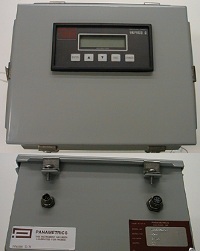 The Ion Chamber Amplifier indicates the neutron flux levels in a CANDU nuclear reactor. If it detects certain low or high conditions, it trips the corresponding alarm circuitry. The amplifier system consists of four distinct sections: Logarithmic Amplifier, High Voltage Supply, Linear Amplifier, Logarithmic Rate of Change Amplifier. The Sartrex Logic Relay Modules are a direct replacement for the C.P. 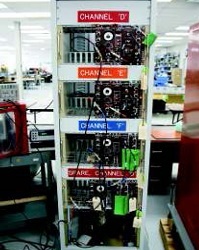 Clare HG3A-1008 relay modules. 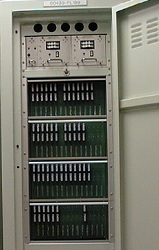 The modules and their chassis are mounted in cabinets in equipment rooms. Each module incorporates an 11 pin octal plug to interface to the mounting chassis. Sartrex selected two C.P. Clare HGRZMT-5111-R05 relays as the replacement units to install in the modules. The coils of the relays are connected in parallel. 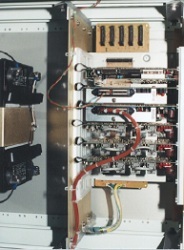 Three of the available 4 Form D contacts are wired out to the connector pins at the bottom of the module to make it compatible to the original relay module. The Sartrex Post Accident Communication System is an independent voice communication system for performing essential tasks during and after an emergency or accident, until the normal plant communication systems can be restored. The system consists of two parallel small telephone exchanges with ten handsets each, for a total of twelve lines. The exchanges allow individual locations to communicate with each other, as well as a conference call facility amongst any three to twelve locations. The customer has a choice of desktop or wall type mounting handsets. The Sartrex Relative Humidity System is designed to measure the moisture content in the gases from eight different process lines in the range of -40C to +10C. The direct measurement of water vapor pressure in each process line is accomplished by using the Panametrics M series aluminum oxide moisture sensor and Panametrics Moisture Target Series 5 hygrometer (Transmitter / Signal conditioner). The sensor (M series) consists of an aluminum strip which is anodized by a special process to provide a porous oxide layer over which a very thin coating of gold is evaporated. The aluminum base and the gold layer form the two electrodes of what is essentially an aluminum oxide capacitor. The Scintrex Model SC-595 Stack Sample Collector collects particulate and radioiodine constituent samples from air in the ventilation stack of a reactor building. An integral pump draws a sample of the ventilation stack air through isokinetic sampling nozzles. As the air sample travels through the system, two removable filter elements trap particulate and radioiodine constituent matter. The outlet of the pump returns the sample airstream to the stack. The system operator removes the filter element on a weekly basis and sends it to a laboratory for analysis. Continuous monitoring or neutron flux is required at all times during Approach to Critical (ATS), upon successful phase over of neutron power measurement by the plant permanently installed instrumentation used to measure neutron flux. During the initial fuel loading and for the first approach to critical the neutron source is from spontaneous fission only and in-core neutron counters are temporarily installed for monitoring at the initial, low flux levels. After first approach to critical and a period of low power testing, the in-core start-up detectors are removed and a photoneutron source causes the shutdown flux to be 10-12 or greater. Neutron flux monitoring is achieved for this range using out-of-core start-up detectors (3He and BF3 neutron counters). TAM consists of two main functional sub-systems. These two subsystems are Hardware Control Circuit (HCC) and Software Monitoring Circuit (SMC). The hardware Control Circuit Subsystem is responsible for all the inputs and outputs of the System (except for Rs232 communication and audio alarm) and is independent of Software Monitoring Circuit Subsystem and can perform its intended safety related functions without software and its related hardware. The Sartrex Temperature Transmitter System for Resistive Temperature Transmitters (RTDs) is an engineered solution to provide accurate temperature control of critical processes in a power generation facility. The main elements in each cabinet consist of Differential Temperature Transmitter Chassis, Single Temperature Transmitter Chassis, an ultra—stable dual DC power supply and associated support hardware. The heart of both the Differential Temperature Transmitter Chassis and the Single Temperature Transmitter Chassis is an Analog Devices RTD input module. 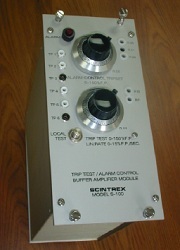 The Sartrex Trip Test / Alarm Control / Buffer Amplifier are part of the instrumentation for the CANDU Reactor. It is related to the instrumentation system for reactors using in-core flux detectors. The configuration of this unit allows for its installation in a NIM BIN. Trip Test – This is a test circuit that when activated, injects a test current parallel to the current injected by the in-core flux detector. Alarm Control – This circuit compares the output voltage from the external in-core flux detector amplifier to an adjustable preset voltage reference. When the input voltage (from the in-core flux detector amplifier) exceeds the reference voltage, it activates the alarm circuit. Buffer Amplifier – The Buffer Amplifier section buffers the signals that go into and leave the alarm control section.